55 people are dead and 136 injured after a pair of explosions at a massive Sinopec refinery complex in China’s Shangdong province Friday. 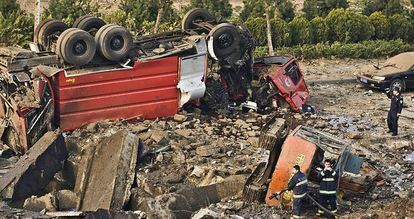 The explosions tore up a roadway in the eastern port city of Qingdao, flipping automobiles and damaging buildings. A resulting petroleum spill has affected 3,000 square meters of water and prompted an evacuation of an estimated 18,000 people. The first explosion occurred as workers made efforts to repair a leak in the pipeline. The second blast happened at almost the same time, as oil leaked into a nearby waterway. Sinopec announced production has been cut at the Qingdao refinery. A production cut has also been announced for Sinopec’s Jinan refinery, but sources indicate production there has been unaffected by the blasts. China’s President and Premiere have both addressed the incident, calling for continued search efforts, and a full investigation into the cause. Sinopec released a statement apologizing for the incident, and announcing it will conduct safety checks on 30,000 km of pipeline. The Qingdao pipeline has been in service since 1986, connecting oil depots in Huangdao with processing facilities in Weifang. The pipeline shipped about 200,000 barrels a day. The pipeline endured two accidents in 2010 due to nearby construction and a trash buildup.